Earlier this month Alice: Madness Returns was released, it is a sequel to an earlier game American McGee's Alice that is based on Alice in Wonderland. The game was PC and Mac only until now as it is included as a bonus with Madness Returns. Not seeing the point of playing the new sequel first I dived into the heady delights of the original game. American McGee's Alice starts with a young Alice surviving a devastating fire that kills her entire family and badly burns her. Blaming herself for her family's death Alice slips into a comatose state and is sent to an insane asylum. 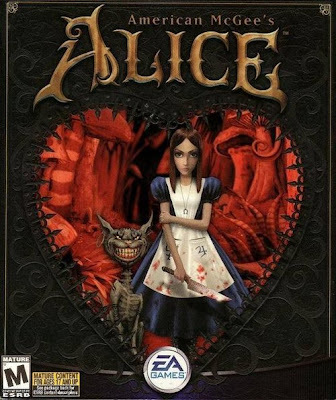 The game starts ten years later with Alice (still comatose) suddenly returning once again to Wonderland, but a strange, twisted, deformed Wonderland that is a reflection of her unhinged mind. In this strange place her old friends and enemies are all changed, creepy reflections of their previous selves. Her purpose she is told (by a zombified white rabbit) is to defeat the Queen of Hearts and restore Wonderland, in doing so also restoring her broken mind. The game has quite the Tim Burton feel about it with the bleak and odd look to the world, and the kooky cast. Being a game from 2000 it does not look fantastic, even HD'd it resembles a X-Box or Playstation 2 game but being designed for PC there is lots of angles, and total lack of clipping which plagued those consoles. Locations are what you would expect from a Wonderland game but all have fresh approaches to them. The Wonderland wood is a vast forest of giant mushrooms and lethal drops, Beyond the Looking Glass takes place in an Insane Asylum ruled over by the insane Mad Hatter (who is also brutally torturing his former friends the Dormouse and Mad Hare) while the Queen of Hearts palace resembles a living heart with fleshy walls and rivers of blood. The locations are all different feeling to play involving plenty of fights as well as the odd puzzle. 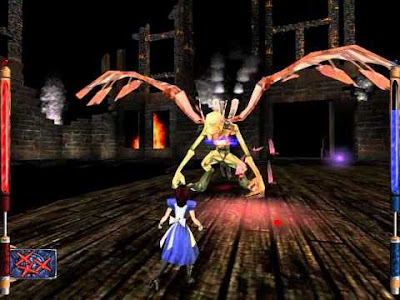 American McGee's Alice features plenty of enemies to battle, from lowly card guards to soldier ants, wailing banshees, demons, and robots. Plenty of boss fights litter the game featuring the more well known characters of Wonderland such as the Jabberwocky (the personification of Alice's guilt), Tweedledum and Tweedledee and of course the Queen of Hearts (who represents Alice's broken mind). To fight all these you get access to lots of weapons, though I found a lot of them pretty useless and stuck to just a few. You get an ace ice wand that freezes enemies, the Vorpal blade (that is shown as a bloody kitchen knife), a deadly pack of cards, jack in the box bombs, cursed dice, and many other strange items. Perhaps too many weapons as switching between them can be a hassle in the heat of battle. Despite the antique feeling to the game it is fun to play, the option to save any where is quite welcome (a throw back to its PC days) as there are quite a few instant death drops (though rather confusingly sometimes falling off a platform teleports you back to stable ground) as well as some tough boss fights. 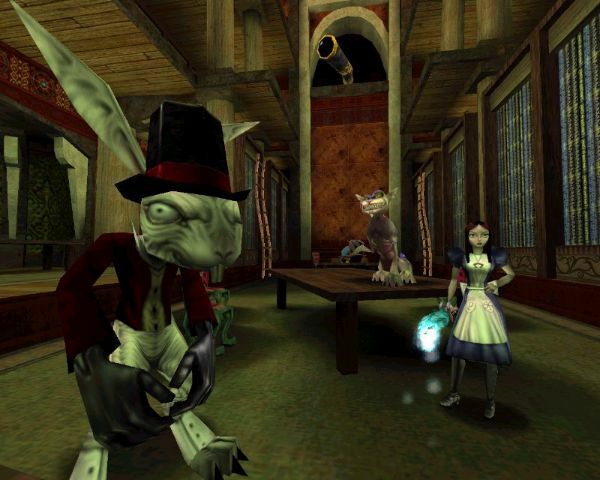 At around 6 hours the game is a decent length, while the plot is not that captivating it is interesting to see the unique take on the inhabitants of Wonderland, that isn't afraid to kill off characters left, right, and centre.